A new booklet has been published about Albuquerque’s Vista Larga Historic District, the first Mid-Century Modern residential historic district in New Mexico. 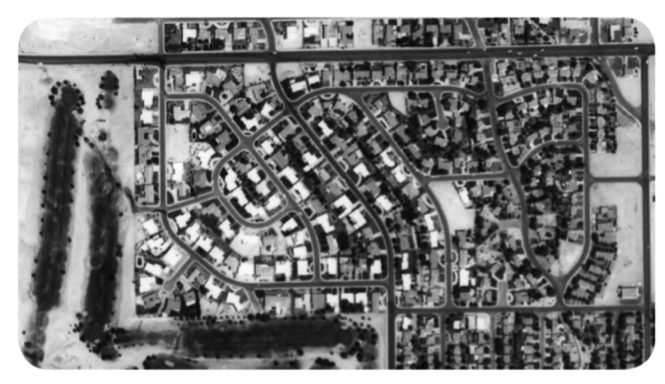 The district is a part of the larger Vista Larga subdivision and is comprised of 112 contributing houses bounded by Indian School Road, Princeton Avenue, Hannett Avenue, and the UNM North Golf Course. In 1942, local developer R. B. Waggoman acquired the parcel and envisioned an up-scale neighborhood situated adjacent to the newly opened university golf course, but not too far from downtown. In 1947, he platted a housing subdivision that he called the Vista Larga Addition built on what was known as the East Mesa. The neighborhood is now listed in the National Register of Historic Places as an example of post-war suburban development featuring modernist house styles. The district’s houses include a variety of “Mid-Century Modern” forms and styles that reflect distinctive characteristics, including Ranch House, Contemporary and International. PHOTO: Vista Larga Subdivision, 1963. Except for a few lots, the house construction is complete. Note Indian School Road running horizontally at top of photo is now paved, while commercial development along north end of Girard Boulevard has yet to be started (right side of the photo). Source: MAGIC, University of New Mexico. DID YOU KNOW? As the Vista Larga neighborhood began to take shape, the new residents needed places to shop for groceries and other necessities. The first neighborhood business to open was a small grocery store, Rhodes Market, located on the northwest corner of Girard and Hannett opened its doors in the late 1940s.